A 10-5 win over the previously unbeaten Latvia duo of Santa Blumberga and Andris Bremanis Friday night at the ATB Centre clinched a berth for Canada in the 2018 Winter Olympics in Pyeongchang, South Korea, where mixed doubles curling will make its debut as a medal sport. And it also landed Courtney and Carruthers in Saturday’s noon (all times MT) semifinal against China’s Rui Wang and Dexin Ba, the silver-medallists at the 2016 World Mixed Doubles in Karlstad, Sweden. The Canadian team put together arguably its two finest games of the 2017 World Mixed Doubles on Friday after barely scraping out wins in two of its final three games to qualify for the playoffs. An 8-3 win over Scotland’s Gina Aitken and Bruce Mouat in the morning draw landed the Canadians in the quarter-finals against Latvia. After giving up a first-end deuce to Latvia, Canada rebounded with a go-ahead three in the second end, a steal of two in the third and one more in the fourth. Latvia clawed back with two in the fifth end, and stole one more in the fifth. 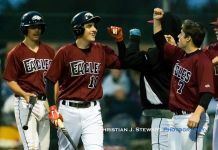 But Courtney’s control-weight outturn takeout hit and stuck for four to prompt handshakes and a celebration. The Olympic berth was the result of a two-year World Curling Federation qualifying process that combined the results from last year with this year to determine the seven teams that will join hosts South Korea. A year ago, the Canadian team of Marliese Kasner and Dustin Kalthoff finished fifth, including two gutsy classification-round wins after losing the quarter-final to fall out of medal contention. While Canada takes on China, Zuzana Hajkova and Tomas Paul of the Czech Republic will be playing Switzerland’s Jenny Perret and Martin Rios in the other semi. Rios combined with Nadine Lehmann to win the 2012 World Mixed Doubles title. Canada has just one bronze medal in the eight previous World Mixed Doubles Championships, won by Alli Flaxey and Sean Grassie in 2009. Meanwhile, both of Canada’s teams will play for gold medals on Saturday in the World Senior Curling Championships, which also are being played at the ATB Centre. 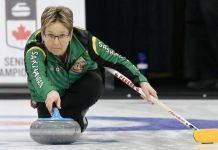 A few hours after Colleen Jones’s Halifax team won its semifinal, Ottawa’s Bryan Cochrane nailed down a 5-2 win over Ireland’s Peter Wilson to ensure that both Canadian entries will win medals. Cochrane, backed up by vice-skip Ian MacAulay, second Doug Johnston, lead Ken Sullivan, alternate Howard Rajala and coach Bill Tschirhart, was in a tight game with the Irish, who were reluctant to mix it up. Canada took two in the first, gave one back in the third, and then took single points in the fourth, fifth and sixth ends to put the game out of reach. Jones, with third Kim Kelly, second Mary Sue Radford, lead/vice-skip Nancy Delahunt and coach Helen Radford, was a 5-3 winner over Scotland’s Jackie Lockhart in the women’s semifinal, and will battle Switzerland’s Cristina Lestander for gold on Saturday at 10 a.m.